We all know about Scott Brown’s truck. But what’s the story behind that coat? 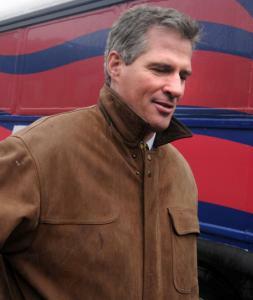 Scott Brown’s pickup truck got almost as much attention as the Senate candidate, but somehow his equally ubiquitous, equally everyman barn jacket cruised below the pundits’ radar. And yet, there it was, starring in his now-famous truck ad. There it was again, waving to motorists. And voting in the election. But what do we know about that brown jacket, really? We spent more time talking about what Brown wasn’t wearing than what he was. Is the slightly worn leather jacket what it appears to be - just something Brown had lying around the house? Or did the campaign hire a stylist to find Brown a jacket that said “Joe the Plumber,’’ but cost $850, like the Burberry canvas barn jacket Saks is selling this season? Mary Lou Andre, a Needham-based wardrobe and corporate image consultant, says the jacket sent a rugged message that an “elitist’’ trench coat would not have. Sadly, there’s no exit polling showing how the election would have gone had he not worn the barn jacket, but history shows that garments as billboards don’t always work. And John Kerry’s barn jacket couldn’t erase his man-of-only-certain-people image in 2004. So what kind of guy wears a Golden Bear Sportswear leather barn jacket? “We sell to everyone,’’ said Everett LaRose, a salesman at the Andover Shop’s Andover location, where a similar-looking Golden Bear Sportswear barn jacket goes for $675. Guess that depends on what your definition of “everyone’’ is. Brown himself didn’t buy the jacket, it turns out. It was a gift from Arianna (the daughter who’s “definitely not available’’). Taking a break from studying pre-calculus over the weekend at Syracuse University, she reported that she bought it at the Wrentham Village Premium Outlets as a birthday present about five years ago. “I like to make him look nice,’’ Arianna said, adding that she also bought him a pea coat for Christmas, which he wore a few times on the campaign trail before “reverting’’ back to the barn jacket. “I like buying clothes for him,’’ she said. That’s in contrast to her sister and her mother, she added, who are afraid to buy him clothes. “He never really wears them.’’ But he does wear clothes from his own mother, she said, including that blue snow jacket. “She seems to know what he likes to wear, which is good I guess,’’ she said. Correction: Because of a reporting error, a story in today's "g" section about Senator-elect Scott Brown's barn jacket incorrectly implies that author Naomi Wolf advised Al Gore on his clothing choices during his 2000 presidential bid. Wolf consulted on women's policy issues for the Gore campaign.